The conditions for the Rohingya stranded at sea off the coasts of Thailand, Malaysia and Indonesia are worsening by the hour. 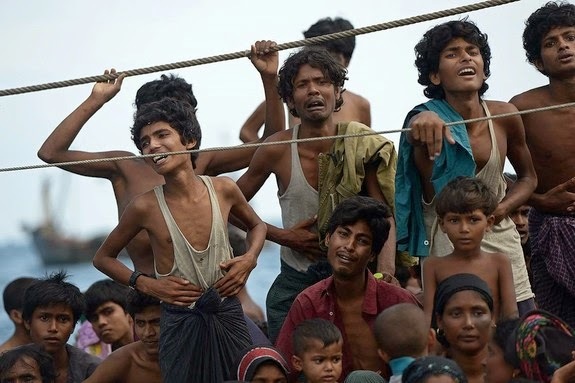 The majority of the world’s media have also been covering this potential human catastrophe and yet there seems to be no political solution in sight, not for the stranded 6,000 nor the Rohingya community, perpetually abused in Myanmar. We are asking all supporters to take action and demand the regional nations, known as the ASEAN communities to find solutions to these problems. Thailand has called an emergency meeting for ASEAN countries on May 29th 2015. That gives us 10 days to try to get as many signatures as possible to demand to ASEAN nations to bring up this issue and to resolutely build for the future and call on Myanmar to review its xenophobic stance on the Rohingya. On the May 28th this petition will be sent to all ASEAN embassies in the UK as well as the Prime Ministers office’s in each of the ASEAN countries. We have little time to make maximum impact. Please sign and share as widely as possible. As you are aware, there are more than 6,000 Rohingya refugees who are stranded in the Andaman Sea as they escape from a constant and rising threat of marginalization and human rights abuses in Burma (Myanmar) and from human traffickers from Southern Thailand. Having endured atrocious conditions in the IDP camps in Rakhine state, many Rohingya have also been trafficked and kept in illegal ‘slave camps’ in Southern Thailand with recent evidence of mass graves as well. Now more than 6,000 are stranded in the Malacca Strait and being prevented from shoring in Malaysia, Thailand and Indonesia. The UN have said that unless a solution is found imminently, a huge human catastrophe awaits the stranded thousands. There are countless numbers of Rohingya who have lost their lives at sea, many drinking their own urine as they run short of food and water and we are now aware that some have even beaten each other to death whilst scrambling for the last remains of food supplies. With Thailand having called an emergency ASEAN meeting to discuss solutions for this on May 29th 2015, we, ‘the undersigned’ urge that the stranded Rohingya are given sanctuary and urgent medical attention from within the ASEAN community. As with any international collaboration of nations, the rights of those who are being persecuted need to be addressed with haste if the ASEAN is to have any lasting impact in the region. In our thousands and in a global chorus of voices we ask all ASEAN nations to put forward responsibly a roadmap of reconciliation of the Rohingya to their homeland, Burma (Myanmar). We urge each ASEAN nation to remind Burma (Myanmar) of their responsibility to protect their population and to grant equal rights to all regardless of ethnicity or religion and to ask Burma (Myanmar) to immediately repeal their unjust 1982 Citizenship Law. For the future of all ASEAN nations it is absolutely essential that all partner nations act with due care to their populations. We hope you will listen to our collective voice.